Discover unique rings from the collections of STEVEN JACOB. We offer truly handmade, heirloom quality, patterned metal wedding rings for people that demand uncompromising design and craftsmanship...Click here to read more. Discover unique rings from the collections of STEVEN JACOB. We offer truly handmade, heirloom quality, patterned metal wedding rings for people that demand uncompromising design and craftsmanship. All of our Damascus steel rings utilize stainless steel Damascus designed and forged in our studios using proprietary methods that produce incredibly detailed and mesmerizing patterns. 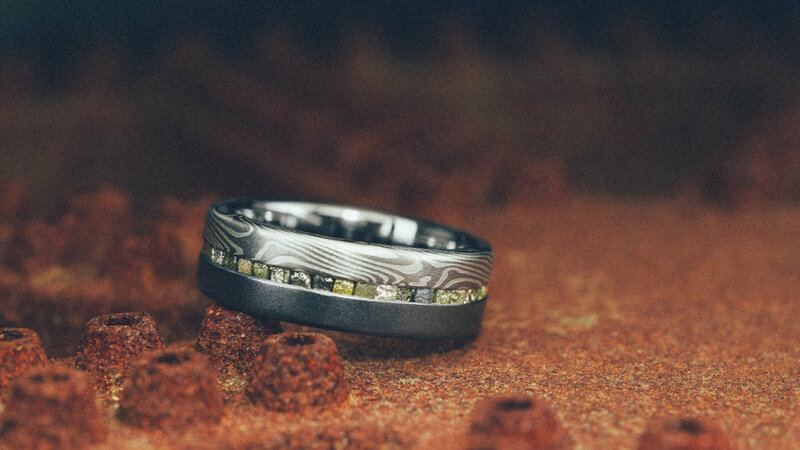 Our Mokume wedding bands are second to none, whether you choose from our selection of dramatic titanium Mokume, or the rich and varied designs in our extensive line of precious metal Mokume, each ring is custom made specifically for you. We are a father and son team with 50 years of combined experience with Mokume Gane and Damascus Steel working together to build the finest wedding bands in the world - one ring at a time. We know what it takes to make a great wedding ring, from the symbolism of the initial forging of two metals into to one, to the ergonomic shape and silky finish of all of our bands. We invite you to explore the depths of what we have to offer and to reach out to us with your own ideas of how we can build the perfect Damascus Steel rings or Mokume wedding bands for you. Sign up with your email to receive updates about new products, workshops and more. Steve literally wrote the book on Mokume Gane and also offers an instructional video on his techniques.